The spillway exists to channel excess water to protect the structural integrity of the dam or other structure into which it is built. The service spillway offers a continuous, regulated or unregulated release from the upstream reservoir, headrace or forebay. Their role may be supported by auxiliary or emergency spillways which add to the discharge capacity in the case of significant flooding or, in the case of gated spillways, to allow for maintenance to the service spillway. Like all elements of hydropower, the spillway design is critical. The discharge capacity has to be optimised for the remotest severity of flood (the cost of modifying an existing spillway to increase its discharge capacity will be significantly higher than the initial cost of a more capacious hydraulic structure). The design has to address a number of factors, not least fatigue and erosion (exacerbated by cavitation: itself a function of pressure and velocity). Our experts’ analysis will include these issues as well as loading (e.g. ice, silt, seismic, even the weight of laden vehicles used during construction - and these loads and others operating in various combinations); the vertical or horizontal curvature dictated by the topography or geology; the terminal structure (hydraulic jumps or baffles: structures intended to dissipate the kinetic energy) and the subsequent trajectory and scouring of the downstream ‘landing’ area (e.g. plunge pool). A spillway’s life could easily exceed 50 years during which they have to perform as planned and designed whilst still accommodating environmental changes: extreme variations in temperature, alternating wet and dry cycles and many of the load factors referred to earlier. Our collaborative work with civil engineers and geological surveyors ensures that our design, the materials chosen, the anchoring, joints, embedded parts and overall construction work combine to deliver a reliable and cost-effective controlled spillway. Finally, KGAL employs some of the most experienced gate design engineers in the world. If your facility includes, or plans to include, radial, wheel, drum, bascule or cylinder gates, bulkheads or stoplogs, plus the operating systems and auxiliary power backup - in need of refurbishment or for an original design - we’d be delighted to hear from you, your existing contractor or consultant, or welcome the opportunity to bid. 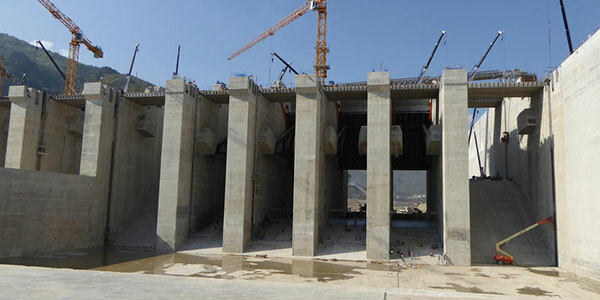 The image shows the giant spillway channels of the Xayaburi Dam in Laos under construction in early 2015. 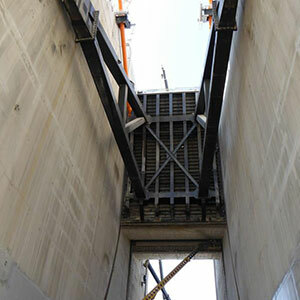 The view, looking from downstream, shows the trunnions for the radial gates which KGAL designed.You'll find more recent images in our Hydraulic Steel Structures brochure; more recent still in this news item which includes a video.